Note the distinctive blue speculum edged with white and the green head. The male Mallard has a metallic green head, white neck collar and a mostly grey body. In flight it has a distinctive dark blue speculum. Resident in most of Europe except the North where it tends to move South in cold/hard weather. Can be found on almost any water including tiny ponds and ditches. Often frequenting parks and boating lakes accepting food from visitors. 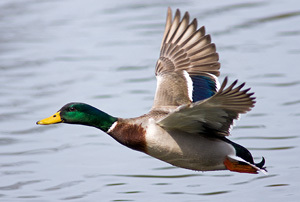 The Mallard is a very common duck in Europe often cross breeding with other ducks leading to varied plumage. A dabbling duck and a ancestor of the domestic varieties. Male and female Mallard in heavy (loud) rain! 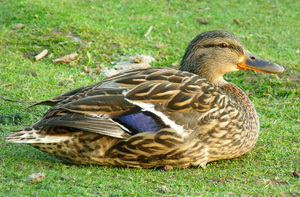 The female Mallard is a mostly brown bird with the same distinctive dark blue speculum as the male bird. Note the dark eye stripe off this female bird with the blue speculum edged in white.